France, probably Paris, ca. 1500-1510. 171 leaves (1 column, 17 lines), bound : vellum, ill. ; 103 x 64 mm. Wakefield Book Shop; purchased from Wakefield Book Shop in 1954 as gift to Julia Parker Wightman from her father (Christmas tag in box inscribed "Julie from Pop"); JPW 2469; Julia Parker Wightman Bequest in 1994. 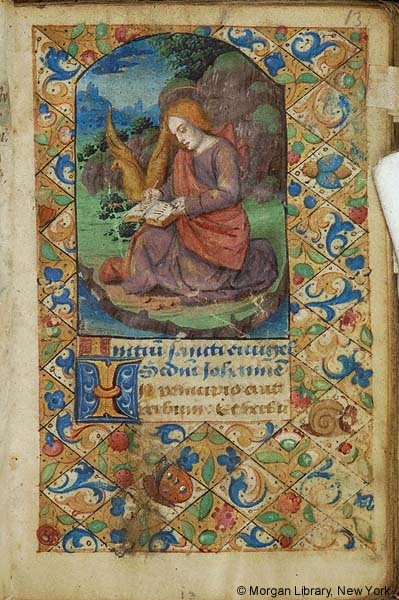 Ms. book of hours, use of Rome (Hours of the Virgin); written and illuminated in France, probably Paris, ca. 1500-1510. Decoration: 12 half-page miniatures with full borders, 6 small miniatures, 5 with full borders, 1 with three-sided border. Textiles: box case lined with velvet. Binding: Brown calf, blind tooled, one brass clasp; in brown morocco box with marbled paper sides, lined in purple velvet, by JPW.